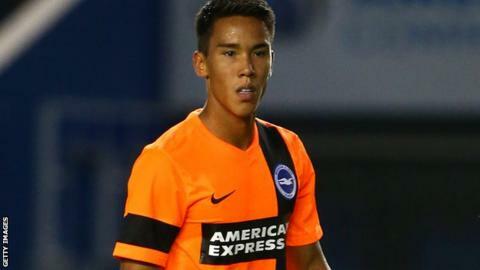 League One side Gillingham have signed Brighton & Hove Albion left-back Adam Chicksen on a one-month loan deal. The 23-year-old, who has made eight appearances for the Seagulls this season, will be at Priestfield Stadium until 13 December. The former MK Dons defender will provide cover for Joe Martin, who is serving a three-game ban for his red card against Crawley in midweek. Chicksen is eligible to make his debut against Leyton Orient on Saturday. The Gills had hoped to appeal against Martin's suspension, but manager Peter Taylor said a lack of supporting video evidence would have hampered their case with the Football Association. "The final bit of the DVD from Crawley didn't actually show the incident," Taylor told BBC Radio Kent. "We are extremely unlucky. I'm not saying Joe hasn't done anything wrong - it is obvious he has pushed a player in the face and he has admitted to that. "We are not trying to someone get off a sending-off, but for Joe to get three matches is extremely harsh."